It seems we just can’t catch a break. After a few days of cold temperatures, it warmed somewhat but the warmer air brought rain the for the weekly club fly. The morning broke with gray skies, an ugly misty rain and little to no wind. By the time we got to the beach, the winds had come up strong. Or as is said around here, “blowin’ a gale”. And there was standing water on the sand. I did have my Flexifoil with me and could have flown it in those winds but I don’t particularly like putting my bags or kites down on wet sand. So we headed to the kite shop to spend some time and chat. The problem with hanging out at the kite shop is that you are on site when boxes of kites are opened for inspection. In this case, a shipment of long-awaited Hyperkites arrived. 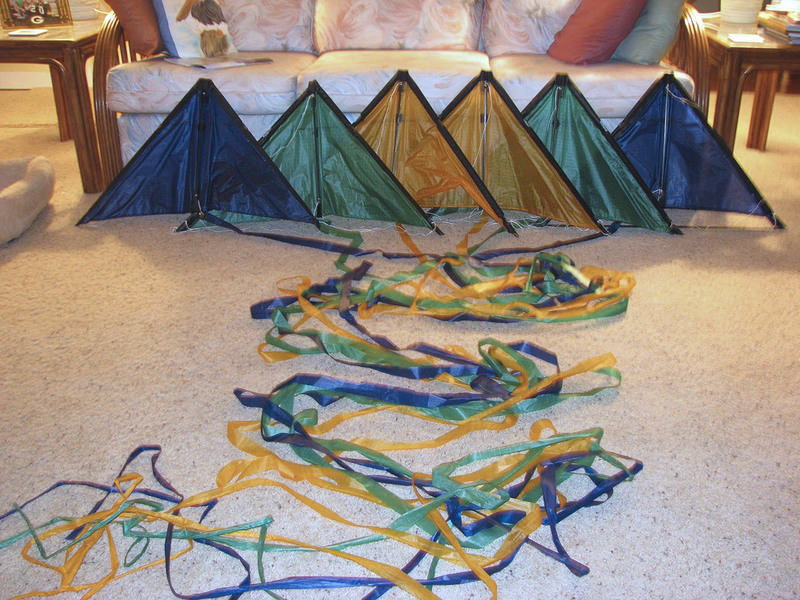 I currently have three stacks of Hyperkites. A vintage stack of six in rainbow colors with the original wooden dowel frames. I have never flown this set and I know it is going to need some work before it is flyable. The second one is a nine stack made up of berry, wine and slate colored kites. The third is a six stack of gold, green and blue. I have been toying with the idea of enlarging the last two stacks but the colors have not always been available. And that was a good excuse not to. However, when this box was opened, there were the colors I was looking for. I made a quick decision to enlarge both stacks while I could as you never know when another shipment would come in. So I ended up buying six new Hyperkites, tails and necessary train lines to add them to my stacks. Now I have to remove the bridals from the new kites and add them to my current stacks with the new train lines. Not a hard task but tedious. I may end up taking the old stacks apart in order to update the order of the colors to accommodate the new kites. We shall see. So the problem with “hangin’ out” at the kite shop is it costs money and gives me another task to do in my “free time”. 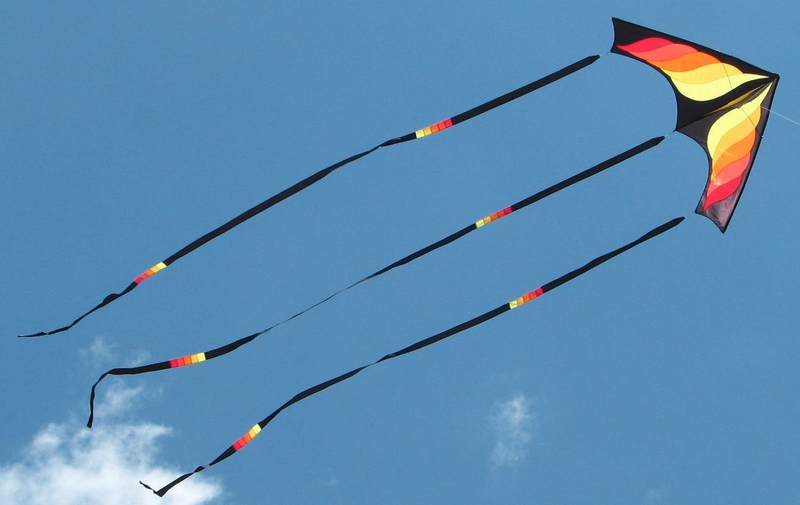 Oh well, maybe the weather will be cold and wet a little longer so I am forced to stay indoors and catch up on all those little kite tasks I’ve been putting off and the new ones I’ve just gained. Glad you found more Hyperkiyes to complete your collection. It really is an addiction isn’t it? Sorry it has taken me so long to reply. If those stacks are still available, I would love to have them. I’m becoming addicted to stacking. Let me know if the offer still stands. Thanks. Yes, She lets us live with her. We live to serve.